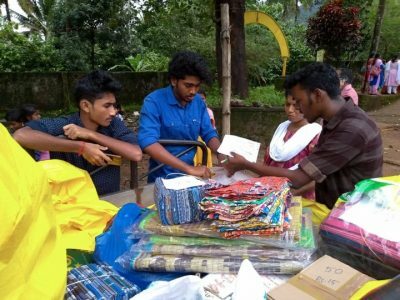 Our partners on the ground, Snehibhavan, visited six camps in Idukki district, including Painave (boys hostel hall, Idukki) with 750 refugees, Muslim madrassa (Maniyarankudi) 150 refugees, SDA school (Anakumbbe) 700 refugees, SDA church (Anakumbbe) 50 refugees, Nalliyani (Government School) 110 refugees, and Pezhakyapalli (KYMC Hall) 50 refugees. Sajini, our partner from Snehibhavan, who was distributing relief materials, shared that access to some of the camps was precarious and they were worried about whether they could go back the same way. Most people, Sajini shared, were worried about their homes and their children’s education being interrupted. Some camp members were in despair and talked about taking their lives. We didn’t know how to console them, Sajini said. If only we could provide them with a small home, even one with a sheet, a small room and kitchen. In the video, Chinnamma, a domestic worker from speaks from the Muslim Madrassa camp in Maniyaramkudi. Chinnamma: The sheet roof over our home and the front yard gave way. We had 4 acres of land, which is all gone now. Is your home still there? Chinnamma: We don’t know with the rains. Chinnamma: It has been raining for 2-3 months now. Did you reach the camp when the rains started? Chinnamma: Yes. The (Muslims?) are taking good care of us. They ask us what we need and feed us four meals. My oldest son was going to buy a lot that is now fully destroyed. We were to pay for it on the 15th and on the 14th it was all destroyed. He has four sons. Where will you all go once the camp ends? Chinnamma: We’ll adjust at a rental home. Will you be in any danger? Chinnamma: We’ll just have to do something. We can’t expect the government to immediately fix our place. It’s not just us it’s all of Kerala.